Lam Soon (Thailand) was awarded the Partner of the Year 2015 from Central Restaurants Group Co., Ltd. (CRG), the leader of food and beverage restaurant chains. CRG operates many well-known brands of restaurant chains such as KFC, The Terrace, Ootoya, Chabutong, Tenya, Yoshinoya and Mister Donut. Currently, CRG has partnerships with more than 200 companies. 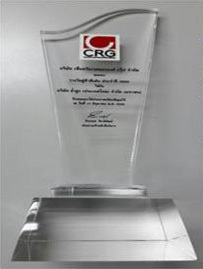 The Partner of the Year 2015 was assessed by CRG through the various factors such overall performance, product quality, delivery process and after sales service.